Let’s get down to business (to defeat the Huns!) and talk about how nasty keyboards get. 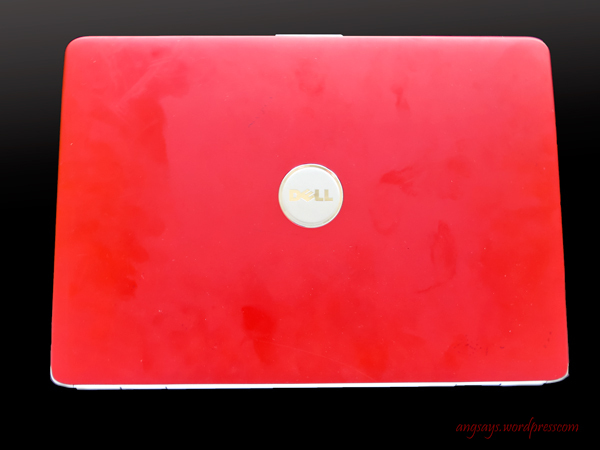 If you’re anything like me, you eat near the laptop and sometimes food particles get lodged in the keyboard and goo latches itself to F and J. Not to mention if you have other people living with you, they touch the laptop too and who knows where their hands have been. I will say that if I’m eating food at the laptop, I have a napkin to wipe my fingers before I touch the keyboard. 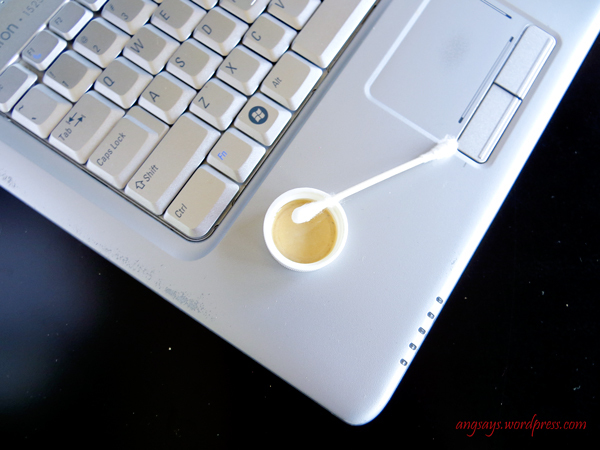 I hate sticky keyboards and this method usually works, but you probably shouldn’t eat or drink at the computer. 🙂 Anyhoo, wiping down the laptop once a week will keep food and finger grime at bay. 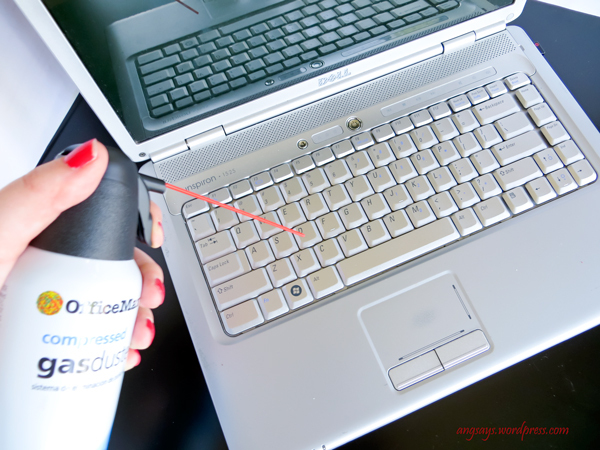 Every few months, you should really deep clean your laptop like the instructions below. Step One: Use compressed air to get rid of dust/food particles in the keyboard. Step Two: Wipe down the screen with a microfiber cloth. Step Three: Use a q-tip and rubbing alcohol to clean between the keys. Step Four: With a slightly damp cloth wipe down the keys and mouse pad. Step Five: Close the lid and wipe down lid. Step Six: Flip the laptop over. Yes, we’re cleaning there too. Step Seven: Use the compressed air to clean the fan. And if you so desire, take off the bottom cover and use the compressed air to dust. See, red things. Obviously, this is a PC and parts of this tutorial will be different for a Mac, perform alternatives as you deem necessary. I’m not going to lie when I say step seven has saved my dear laptop, Max. He would over-heat and die in the middle of a Netflix show but after thoroughly dusting the fan he stopped dying randomly. I also like typing on my keyboard and not feeling crusties and goo, so I clean my laptop every other week or so whenever it gets nasty. I recommend that you wipe down your every week or so but completely understand if you don’t. Visiting from My Turn For Us. My stepdaughter had a year old Gateway computer. She always left it on and it was usually on her carpeted bedroom floor. It kept shutting off after being on for a few minutes so she wanted and got a new computer but I took the old one. I started cleaning it up, trying to get programs and data off the computer and I learned how to take it apart. I wanted to see about upgrading, adding more memory or whatever. When I used the canned air it blew this thing out that looked like a sponge filter and it was about 1/2-1″ thick. I thought how odd to have such a huge filter in there, how could the computer really breathe? Then I looked again and IT WAS ALL DUST AND FILTH! I took everything apart, sprayed with like 3 cans of air, wiped everything with alcohol (I had a brand new Blackberry that took the toilet swim and survived. Learned alcohol is my buddy and it kills germs really fast.) and it still runs perfect today. I gave it to my mom as a thank you for everything she does for us. I left it in her car as a surprise because she was going out of town the next morning and wanted a computer to use. She still uses it. Thank you for the reminder. You’re welcome! I’m glad to hear that your computer came back to life after a good cleaning. 🙂 Thanks so much for your comment and for visiting! Thanks for the reminder to get compressed air!! I have crumbs, etc., too. Hubs has blown mine out (he will only use a desktop—hates the laptop I love) and he’s vacuumed it. I happen to have alcohol wipes and I use them for surface cleaning. they can easily go between keys and are way less trouble than q-tip. If there’s an easy way, I find it!! Haven’t done the taking the bottom off though. Thanks. After cleaning my work keyboard, I was reminded that I really shouldn’t eat near the computer because of how many crumbs came out of it. I’m gonna have to try the vacuuming tip next time. Thanks for stopping by. That’s a great tip. I use a little artist’s brush after I’ve taken the bottom off to get into the tiny crevices. With a slightly damp microfiber cloth. Doesn’t the compressed air just push it down further into the keyboard and fan? If I want to clean my keyboard I just turn the whole thing upside down and tap gently. You cannot believe how much comes falling out onto the desk/surface. When I vacuum I use that moment to run the narrow nozzle of the vacuum over all the surfaces which means the keyboard and fan areas. I am wondering why you need compressed air at all if you own a vacuum. I’ve found that the compressed air really loosens up the stubborn dust and dirt. I’ll have to try your tip though. Thanks for visiting. It can kill your computer out using the vaccum . It is electrical & can send a spark through it. I’m sure my computer is a heaping mess of grossness–I’ll have to try this soon! Thanks for linking up to Frugal Crafty Home! Such great tips!! 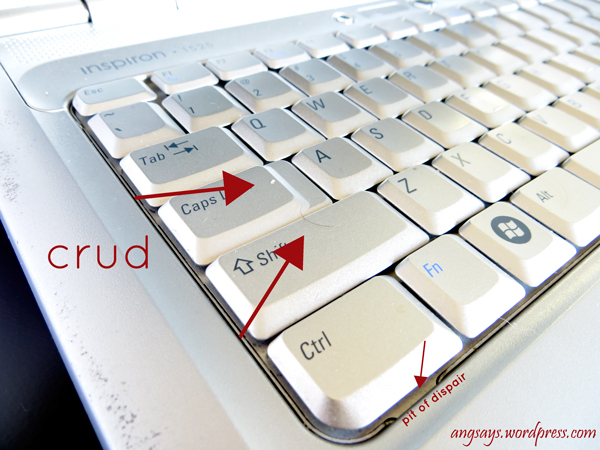 My mac key board could totally use this! Thanks! And thanks for your sweet comment on my blog! Thanks! You’ll be able to see more of a difference with the white keys. 🙂 And you’re welcome. I’m glad someone got it! 🙂 I couldn’t not write it because it kept running through my head. Awesome. I need to do this. Your computer and fingers will seriously thank you if you do. Thanks so much for dropping by! I have been looking for this for like 100 years!! Finally found it! Haha you’re welcome. 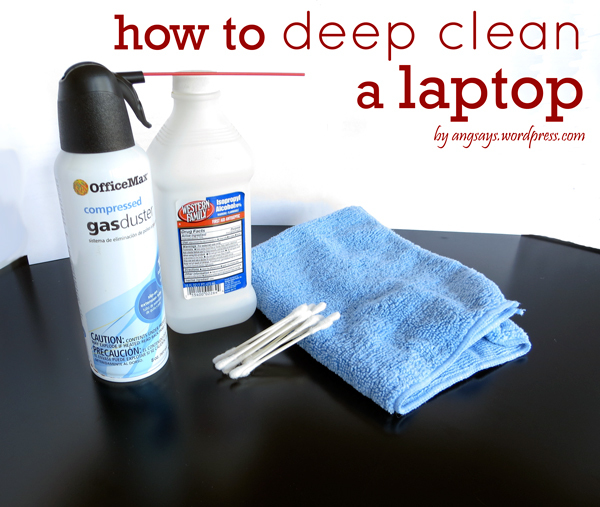 I won’t touch the laptop if it’s nasty so I just clean it. I am a computer technician. Compressed Air doesn’t really work all that well. It is moist and can cause damage. Besides that, it doesn’t have enough power to do the job. I recommend a DataVac. They are about $50 on amazon and work very well for all sorts of applications. I even use mine to dust ceiling fans and the tops of curtains at home. 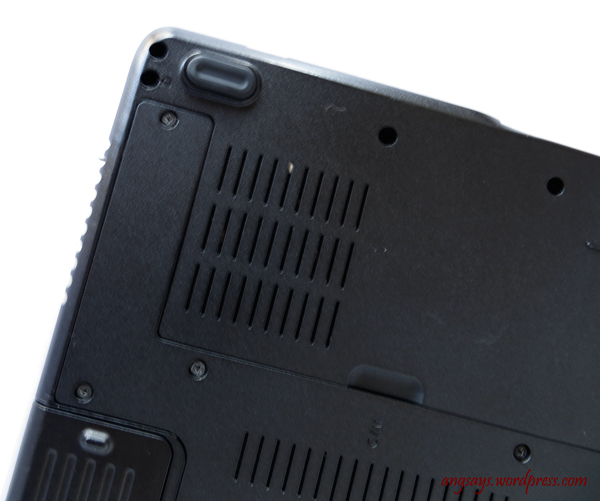 One other thing to be aware of: when you are cleaning the bottom of your laptop, there is usually a Windows sticker on the bottom. Do not wipe these. There is a series of 5 5 letter codes. If you do not have these and your computer needs to be reloaded, you may have to buy a new copy of Windows. I recommend using clear packing tape to cover it to avoid it rubbing off. One final note, NEVER use alcohol based cleaning products on your screen. I recommend either screen or lens cleaner or a SMALL amount of white vinegar. Just be sure to use a soft rag and don’t get it wet. Wow! Thanks. I only use that lens cleaner on my screen but the little wipes sometimes dry out before I can clean it completely. I should clean it more often. Great tips, thank you!!!!! Holy crud my labels are rubbing off. I am going to put them in my password book so in case something happens I have them. They are very difficult to read right now. Thank you so much for your help. Great Advice! I really need to do this. Thanks for sharing it at Think Tank Thursday. I have featured you today. Thanks so much! I’m so glad you found my tutorial helpful. With step 1, you should tip the keyboard upside down. We do this with our keyboards at work and it gets so much more dust and crud out. Who knew a pharmacy could get so dusty?! Great tip! Now that I think about it, I usually do this half the time, more often when I see lots of crud coming out. Thanks so much for commenting. Compressed air on the fan is not good. It can create an electrical pulse to fry internal components, and at the very least destroy your fan. You should stop the fan from moving FIRST, then you can use the air method. I definitely need to deep clean my laptop. Thanks for the great tutorial… I’m featuring your cleaning tutorial tomorrow at my Friday Features from this week’s Inspire Me Monday’s linky party. Thanks for linking up!